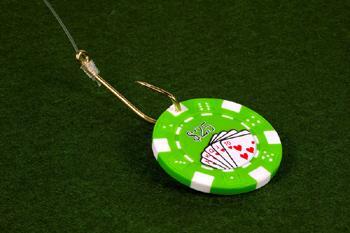 For some, gambling is something to do on a yearly trip to Vegas or at the annual New Year's Eve party. For others, it's a regular habit that becomes a potentially life-destroying addiction. Just like with substance addiction, it can be very difficult for a compulsive gambler to just stop, even after it has caused negative consequences. However, it is possible. It might seem impossible for you to sit at home and avoid the lure of the poker parlor down the street. That's why planning ahead is so important. Come up with a list of activities you enjoy that can fill the void that gambling fills for you now. For example, if you spend every Friday night playing video slots, join a book club that meets on Friday nights instead. Make a list of people in your social network that are not involved in gambling and find out what they do for fun, and then ask if you can go along. Also, list things you can do solo, such as watching a DVD, meditating, or running. Cut off your access to cash so you have no money to play with. This doesn't mean quitting your job, but it does mean closing your credit card accounts. It also means asking a trusted friend or family member to deposit your paycheck into an account that you cannot withdraw money from without their consent and to only take out money for necessities. If you gamble using your computer, block all gambling websites. Stay away from businesses that allow gambling, such as casinos, race tracks and lottery ticket merchants. Don't hang out with gambling friends. Many people gamble to escape stress, depression, boredom and loneliness. Try to determine why you gamble so you can identify what your triggers are. For example, if you gamble due to stress, you could get triggered by a tough day at work or an important exam coming up. Some people have more than one trigger, especially if they have been gambling for a long time. When you get triggered, consult your plan from step one. This can help you avoid relapse. Then, write down how you were feeling when you had the urge to gamble. When you feel as though you simply cannot control your urge to gamble despite your best efforts, you may be a pathological gambler. The Semal Institute out of UCLA defines pathological gambling as "a continuous or periodic loss of control over gambling; a preoccupation with gambling and with obtaining money with which to gamble; irrational thinking; and a continuation of the behavior despite adverse consequences." If following the advice above does little to curb your gambling, you may have reached this stage in your addiction. If so, it's important that you reach out for help because this may be something you can't do alone, no matter how hard you try. Gamblers Anonymous has meetings all over the United States, as does SMART Recovery, and some addiction treatment centers have groups for problem gamblers. It may be easier to share your struggles with like-minded people than with friends and family, especially if you want to keep your financial problems a relative secret. Meeting others in recovery is also a great way to start building a new social circle. If you'd rather speak to someone by phone, call the National Council on Problem Gambling Hotline at 1-800-522-4700 for confidential information. Individual therapy can be helpful to stop gambling permanently, especially cognitive behavioral therapy. It can help you deal with the negative thoughts that led you to use gambling to feel better. According to MedicineNet, 70% of compulsive gamblers have a coexisting condition, such as a mood disorder or another substance abuse problem. In these instances, the coexisting condition needs to be addressed in order to successfully conquer your urge to gamble. While gambling is not a physical addiction, you can still find yourself going through a withdrawal of sorts, feeling depressed and anxious when you initially stop gambling. That's because the emotions you tried to mask with gambling can now come to the surface and be dealt with and explored in a healthy way. Give yourself some time to heal and feel better. Self-care is essential during the early stages of recovery.